Robert McCausland Limited is the oldest stained glass company in the Western Hemisphere. RML is also the longest, continuously owned family company in Canada. Founded in 1856 by Joseph McCausland, an Irish immigrant, the firm has survived five generations. Andrew McCausland, has captained Robert McCausland Limited since 1977. The company is in the business of designing and producing new stained glass windows, restoration and repair, light boxes, outside storm glazing, sand blasting, and installations. Our work is respected throughout the world and is treasured by many. 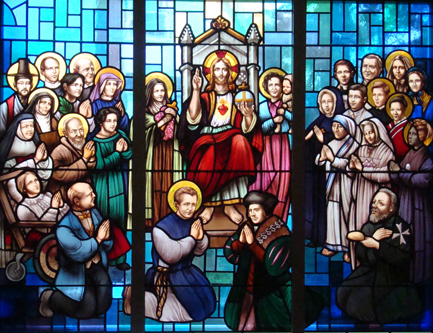 Stained glass is used as a memorial in religious buildings to honour those that have passed on. In a secular setting it is used to accent an interior and is usually the focus of a room. We subscribe to an old adage that the client is always right. We work very closely with our customers to produce a window that both our client and Robert McCausland Limited can be proud. Robert McCausland Limited is the benchmark for industry standards and quality by which all others are compared. It is the commitment of Robert McCausland Limited to produce the finest work using the very best materials at a fair price to our clients. We are responsible to deliver on time and respect deadlines. To date, we have created thousands of custom made windows that are displayed all over the world. We will create the finest stained glass window using the very best European glasses and craftsmanship at a very fair cost.